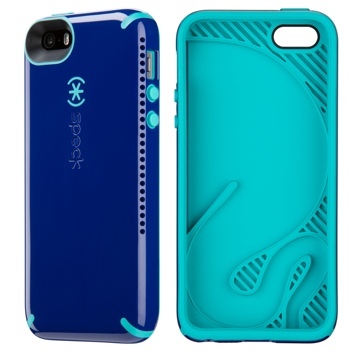 Last week, Phone case manufacturer Speck introduced the CandyShell AMPED, an acoustic phone case designed to naturally amplify the sound that comes from the speakers of your iPhone 5 or iPhone 5S. As you can see in the picture, there's a scientifically-based acoustic guide built into AMPED cases. Sound enters the thin, horn-like chamber at the smallest point at the bottom and then ricochets off the internal walls on the way to the wide-mouthed exit. The end result of this journey is sound that's an estimated 2x louder than a naked iPhone. We got our hands on a case to check out this claim and we were impressed. In our testing, there was a significant boost in volume without noticeable distortion. Of course, the AMPED case is loaded with plenty of protective features too. The raised bevel of the phone grips surfaces, keeping it from sliding around. It also meets the military's MIL-STD-810G standards for protecting your device against impact, while rubberized button covers keep the phone's hard-to-clean parts safe from dust and sticky fingers. And best of all, AMPED does all this while still maintaining a slim 0.58" deep profile. The glossy Speck CandyShell AMPED for the iPhone 5/5S comes in your choice of black, blue and pink colors. It's currently available at Speckproducts.com and at AT&T stores nationwide with a suggested MSRP of $44.95.